We recently had a deli dinner night with the works: corned beef, pastrami, potato salad, cole slaw, rye bread and pickles. To top off the deli experience I made kugel! I had barely enough noodles, but no apples. I peeked through my pantry and found applesauce. I thought, “Surely there must be some sort of awesome substitute using applesauce instead of chopped apples.” And sure enough, there is! Oh and I also have a confession. It might be sacrilegious. To make sure I had plenty of noodles, I added a scant 1/4 cup orecchiette pasta…! I don’t think I’d make an entire noodle kugel out of orecchiette, but as a small addition, it ain’t that bad! p.s. 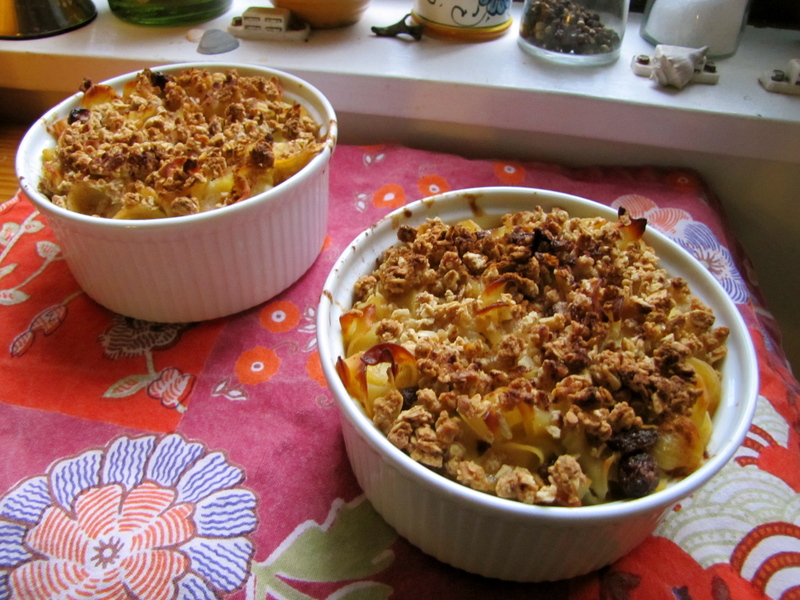 one more thing: when I made it, I halved the recipe which is why the photo shows the kugel in ramekins. Usually you’d put it in an 8×8 glass baking dish. The recipe below show the full proportions. Preheat oven to 350. Butter bottom and sides of an 8×8-inch baking dish. 1. Cook noodles according to package instructions and drain well; set aside. 2. In a large mixing bowl, whisk eggs until well combined. Whisk in 5 tablespoons melted butter, 2/3 cup granulated sugar, applesauce, yogurt and vanilla until well combined; stir in raisins and noodles until combined. 3. Spread mixture into prepared baking dish; evenly sprinkle with granola and cinnamon. Drizzle with remaining 1 tablespoon melted butter. 4. Bake 40-45 minutes or until golden brown, set, and bubbly. This looks like a great recipe! I love the thought of not having to chop apples. My husband is Jewish but I’m not so I never learned how to make all of the traditional foods for his holidays but I’ll definitely try this one 🙂 You’re other recipes look awesome too so I’ll definitely be adding you to my list of sites to check. Thanks! Thanks and good luck with the kugel!